I've been awake off and on since 4:30 because of all the birds! Our alarm clock at home comes on with birds chirping so now everytime I hear birds I wake up. The sun is just coming up and I am hearing the opening sequence of the lion king in my head from seeing the African trees silhouetted against the sky outside the window. The night was cool but I feel like today will be hot and sunny. We leave at 7:30am. Our group of seven: David, our Maasai guide; Rhoda, aka Bubbie, our 86 year old world-wide adventurer; Greg, Alix, Mindy, Jed, and myself. 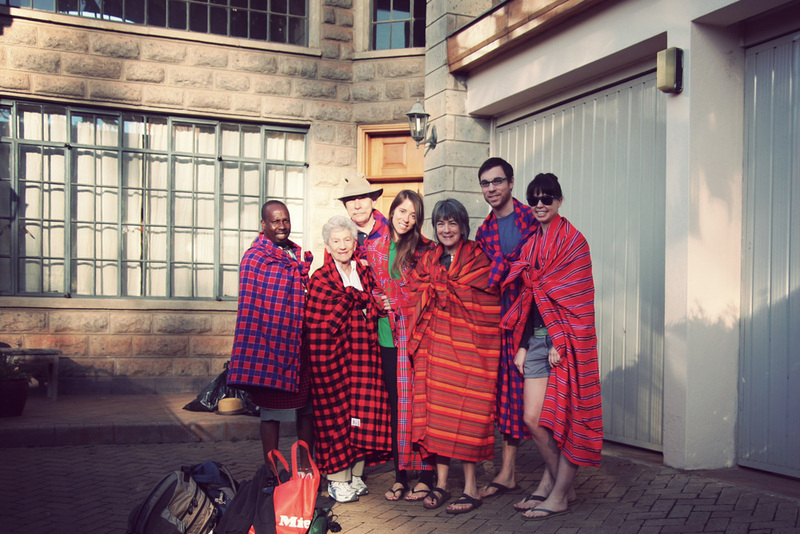 We're adorned in Shukas, the traditional Maasai robe. Any culture that values wrapping oneself in a large cozy blanket ranks high on my approval list. David is a Maasai warrior ("Moran" = "warrior" in Maa - which all seems rather fitting considering Jed's last name). The shukas are dyed in reds to differentiate from different tribes. David is married to an Australian named Merry - they started the safari company 'Enaidura Big Step' together after they met 3.5 years ago. David was working for another safari company and Merry was here as a client - They shared a similar vision for giving a unique safari experience that also includes learning about the Maasai culture. One of our stops over the next 10 days will be a visit to David's village. The land here is so fertile - everything grows. As we drove out of Nairobi our host, David, pointed out all the different kinds of crops. Pineapple. Banana. Mangoes. Coffee. Corn. Rice. Flowering trees of all kinds. I get the feeling that if you just throw a handful of seeds on the ground and wait an hour, something will spring up. I think about Ishmael: whereby mankind takes up agriculture and goes from a culture of leavers to a culture of takers. But there is something very natural about cultivation here. You can't deny that there is a half of us that wants to settle and a half of us that wants to roam. We just had a very informative and persuasive demonstration about the magnetic forces at work and how we can tell when we are on the equator. This, with only a jug of water and a stick. It is really true that water turns in different directions in each hemisphere, and there is no rotation whatsoever on the line of the equator. I stood at the center of the earth today. I also bought a souvenir at one of the many shops. Bargaining not being my strong suit, I let Greg handle the bartering and thought we did well going from 800 ksh (Kenya Shillings) to 350. As we were soon to find out the same bird souvenir could be had for 200 from the gift shop at our camp, but it is really hard to haggle over 4$. When we stepped onto the property, we were greeted with cool eucalyptus scented towels and refreshing fruit juice. The roads were fairly dusty and bumpy ever since the equator so this was quite welcome. We decided to eat lunch as our rooms were not quite ready yet. The buffet is wonderful! Not too much food, but lots of selection and a surprising amount of vegetarian options. There are lots of fresh fruit and vegetables. 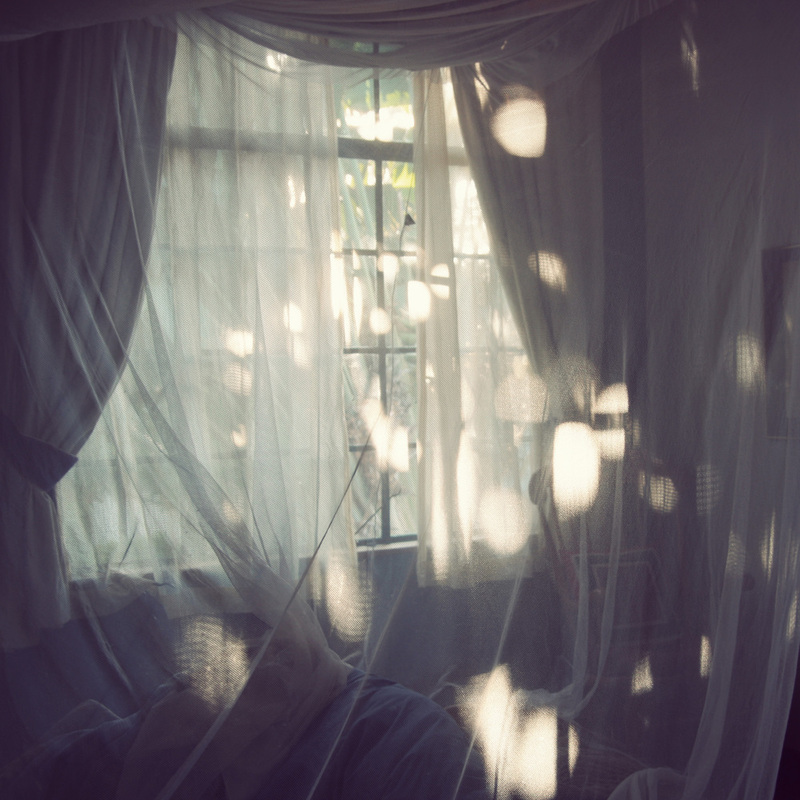 Our rooms are amazing. I had no idea what to expect as I only briefly glanced at the itinerary before I left. 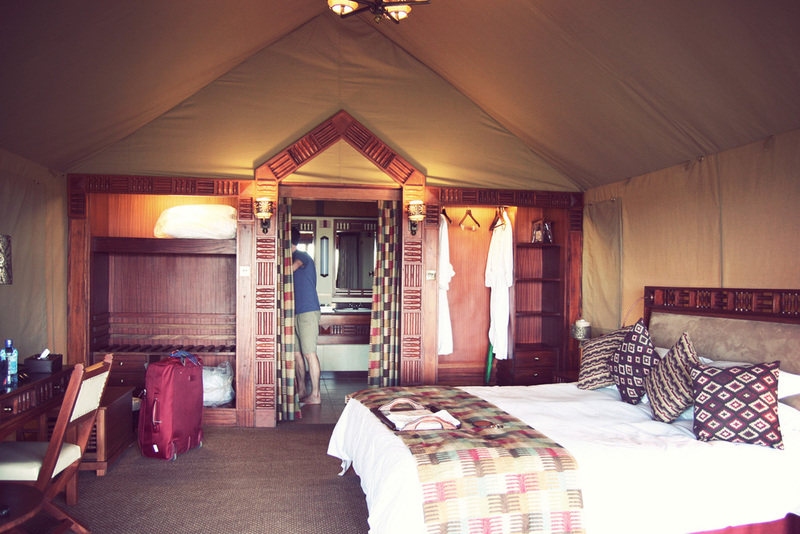 The rooms are 'tents' - more like luxury tent-shaped suites! Everything is made with carved wood - there is electricity and hot water and we face straight out into the conservancy. From our front porch I can see Warthogs, Impalas, birds, and miles of scrubby grassland. 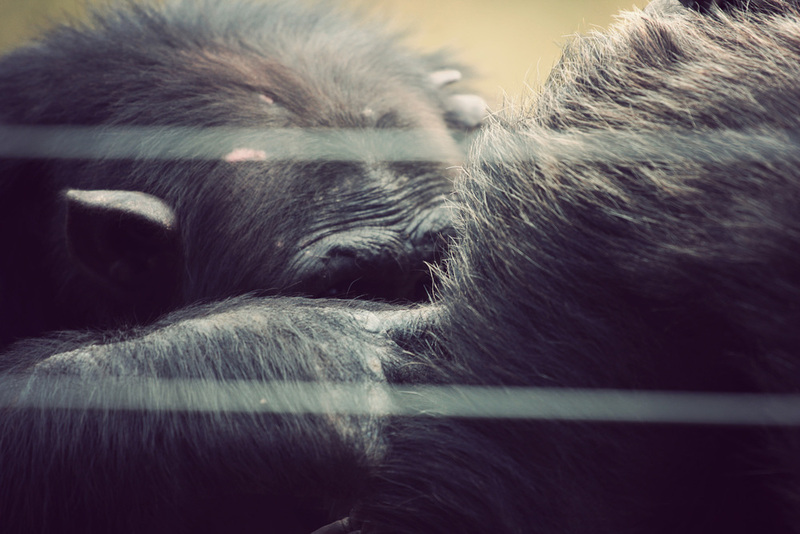 Our valet told us quite seriously not to leave our doors open during the day 'because of baboons.' I am envisioning coming home to find a baboon in my bed, which would make for an entertaining show of male dominance. We're meeting David at 3:30 for our first Safari. 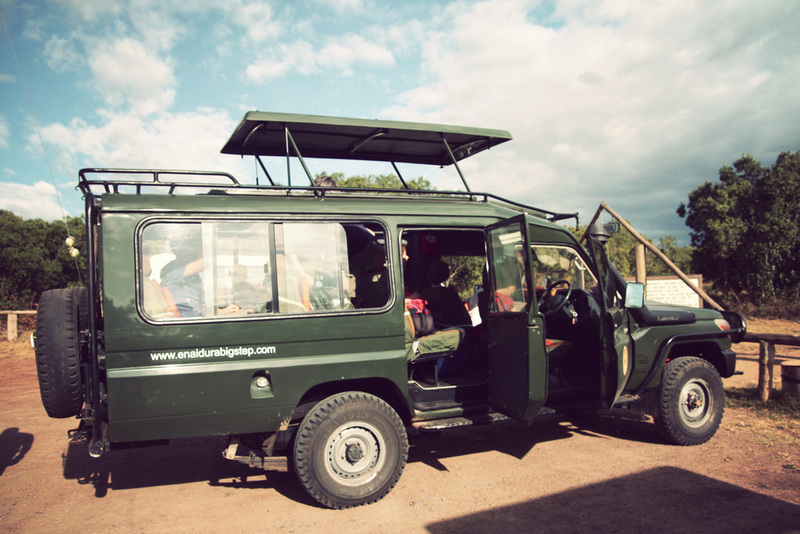 Our first game drive was amazing. I can confirm that safari is almost exactly like how you picture it: You stand up in a big land-cruiser with binoculars and a tilley hat, bouncing along slowly on dirt roads, when suddenly you see some magnificent animal ahead: in our case, the first was an elephant. You can't believe that you are witnessing something so beautiful from so close without being in a zoo or a stage set. 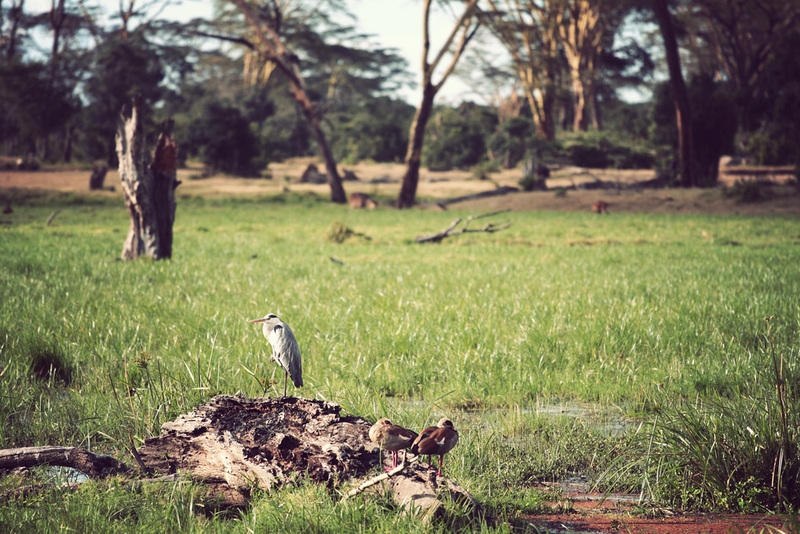 The Ol Pejeta conservancy where our tented camp is based is huge - 360km2 / 90 000 acres, and contains a high density of wildlife that operates more or less exactly as in nature. The 'Big Five' animals are Lions, Cheetahs, Leopards, Rhino, and Buffalo. The reason they are called the big five is because they are the animals that were most hunted and poached because they offered the highest risk / danger (and therefore excitement? pride?) at having killed them... I will never understand the concept of hunting for sport, and firmly believe that you have to be religious to enjoy killing animals (God put them there for YOU). David is an incredibly knowledgable guide. He can list every bird we see off the top of his head, and seems to have better than 20/20 vision. He can spot things in the distance that you would swear are invisible to the human eye. Which is quite handy for us. I can feel my eyes adjusting to the need for gazing off into the distance and it's making my head hurt a bit. We really weren't designed to stare at computers all day. 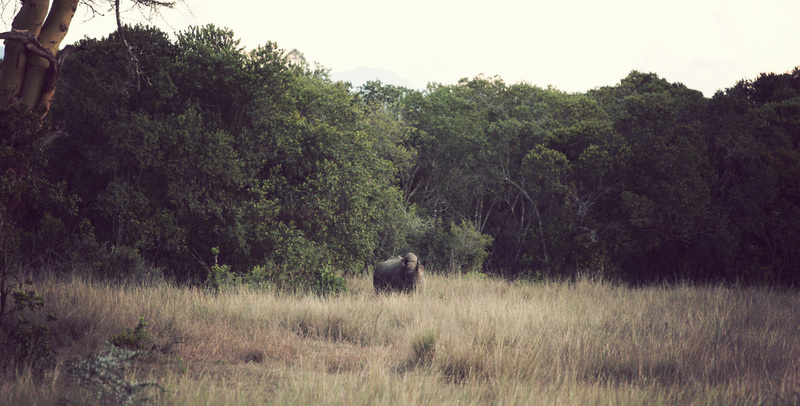 We saw 3 of the big 5 today: Rhinos, Lions, and a lone Buffalo. We also saw an Elephant, lots of Water Buck, Thomson and Grant Gazelles, Impalas, Warthogs, Zebras, a Blue Heron, Sacred Ibis (on the tree), lots of other beautiful birds, and Chimps (in a fenced compound, as they can become aggressive and are under a special breeding program). We went for drinks before dinner - I had a Stoney Tangawizi (ginger beer) and rum. It was delicious. Dinner was buffet - it feels a bit resorty here in the evenings but I guess that's the easiest way to feed 150 guests. Our beds were turned down with hot water bottles and now I'm going to sleep - we wake up at 5:45 for early morning safari tomorrow.